CRM software covers the huge set of packages that allows the business manage customer records, customer interaction, customer service, get right business information, assist seller/companion relationships, track leads and manage contacts. It not only assures better sales opportunity however additionally reflects on what businesses concern for and keeping the customers satisfied with products/services. CRM solutions complement the sales pipeline and also helps business to take full charge of control over business reputation efficaciously. CRM development is a great way to stay linked with customers, which facilitates to realize the issues in the services/products and even recognize what they surely anticipate. With the increase of customer base, it’s quite toughest task to manage customer base. By embracing CRM solutions, it’s easy to show off the customer attention that defined the organization from the beginning till the end. Moreover, a fabulous customer service serves as an agile brand building and further provides a reliable grip on the market. As one of the leading provider of CRM solutions in India, we render CRM software services with a set of tools to control the entire sales process, from the preliminary lead requirement to possibility management, forecasting, and eventually leads to closing of the deal. 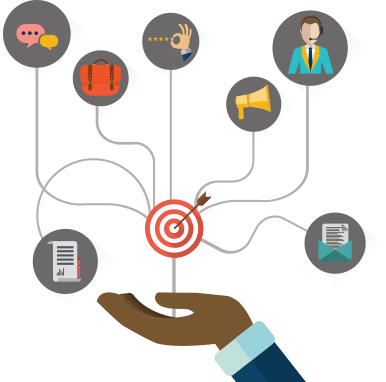 Using CRM can identify the source of leads opportunity and closed sales. It also helps to find the targeted audience and keep them updated with the upcoming campaigns and the latest affairs. This system can also make marketing team to keep a track on various channels, campaigns such as traditional email and phone applications, email, search engines, and social media. With the advantages such as gaining reliable insights, understanding the customers better, collaborating effectively and accelerating team performance drive the businesses to use CRM software in all stages of business.